An infamous mafia massacre ocurred on 14 February 1929. Prohibition in the United States gave a massive boost to crime. In Chicago in the 1920s gangs made fortunes from illegal liquor and the associated protection and vice rackets. The relationships between them were uneasy and there were shifting alliances, disputes over territory and attempts to take complete control by ambitious leaders. In 1924 a storm of violence broke out between the Italian-Sicilian mob led first by Johnny Torrio and then by Al Capone on the city's South Side and the Irish-Jewish crew under Dion O'Banion on the North Side. The Chicago Sun-Times talked of 'the bootleg battle of the Marne' and an editorial in the Herald and Examiner declared 'This is war' as gang killings and gun battles shook the city. Incongruously, Dion O’Banion owned a flower shop on North State Street, where he liked to serve customers and arrange attractive bouquets and window displays. He also supplied wreaths and flowers for expensive gangster funerals. He was greeted amiably there one day by four customers who shot him dead, and his was the most lavish funeral yet. Capone sent a basket of roses ‘From Al’. A peace treaty was organised in 1926 by the leading gangsters, but it did not hold. Capone, who was cheered to the echo by crowds at sporting events, drove about in an armoured car and was an exceptionally generous tipper. He was intent on taking control of Chicago and was on his way to becoming the most famous criminal of his time. O’Banion was eventually succeeded as leader of the North Side gang by George ‘Bugs’ Moran, an Irish gangster known more for muscle than brain power, who had no intention of submitting to ‘them Sicilians’. On 13 February 1929, a tempting phone call to Moran told him that a truckload of whisky had just arrived from Detroit and he could have it at a bargain price. He ordered the whisky to be delivered at 10.30 the next morning at the garage of the S.M.C. Cartage Company on North Clark Street, where he kept his bootlegging trucks. It happened to be St Valentine’s Day, the day for delivering tender tokens of affection, when a Cadillac, ostensibly a police car, drove up to the building at around 10.50 am and five men got out. Witness statements varied over details, but it seems that two of the men were in police uniforms and the other three in ordinary civilian clothes. They went into the garage. Eight minutes later, after loud rattling noises and what sounded like trucks backfiring, two of the civilians came out with their hands up, shepherded by the third, and the two ‘police officers’ with guns in their hands, described by a witness as ‘walking slow and easy-like’. The men drove away, neighbours cautiously investigated and found a scene which would make headlines all over the country. Six dead men and another who was dying were lying on the concrete floor among scattered tyres, pools of blood, chairs and shell casings at the foot of a wall. Five of them were members of Moran’s gang, another was a Moran hanger-on and the last was an unfortunate mechanic who worked in the garage and just happened to be there. His dog was the only survivor. The police investigation showed that the men had been lined up against the wall and mowed down by machine-gun bullets sprayed efficiently across first their heads, then their chests and finally their stomachs. Two of them had been finished off with a shotgun. Some of the bodies’ heads, arms and legs had been severed. The dying Moran gangster was taken to hospital. When the police asked who shot him, he answered: ‘Nobody shot me.’ He died a few hours later, still refusing to say what had happened and who had done it. Capone was away from Chicago at the time, but few doubted who had ordered the massacre. Certainly Moran had not. The assailants had presumably intended to kill Moran himself, but he arrived late at the scene. One of the dead men who looked and dressed rather like Moran may have been taken for him by the gunmen. They may have been a mixture of Capone’s men and hitmen brought in from outside. After long and complicated investigations, two Capone gunmen were accused of the killings and sent for trial, but one of them was murdered and the other was given an alibi by his girlfriend. He too was murdered later on. Moran managed to keep control of his territory for a while, but the North Side gang never recovered and was presently taken over by an operation called the Chicago Outfit. 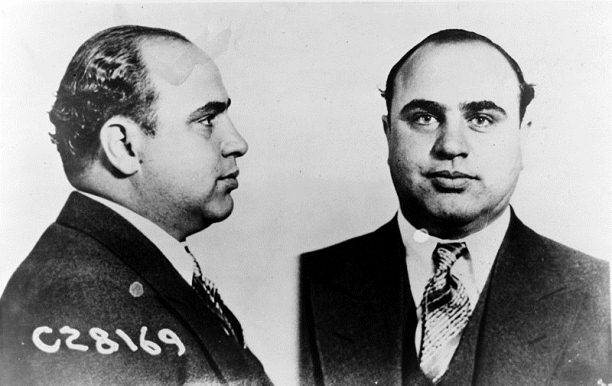 The massacre concentrated the federal authorities’ attention on Capone. He was convicted of income tax evasion in 1931 and sentenced to prison for 11 years. He died in 1947. Moran died in prison ten years later.